Perfect for vintage or Early America style weddings! 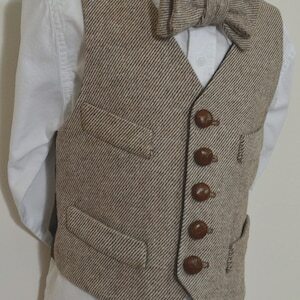 Our newest design, we are proud to offer this knickerbocker, vest and bow tie set in all toddler sizes. Featured design is a lightweight all-season luxury wool suiting, smooth and comfortable, in a check pattern, beige with light yellow stripe. Custom fabrics and colors are also available! 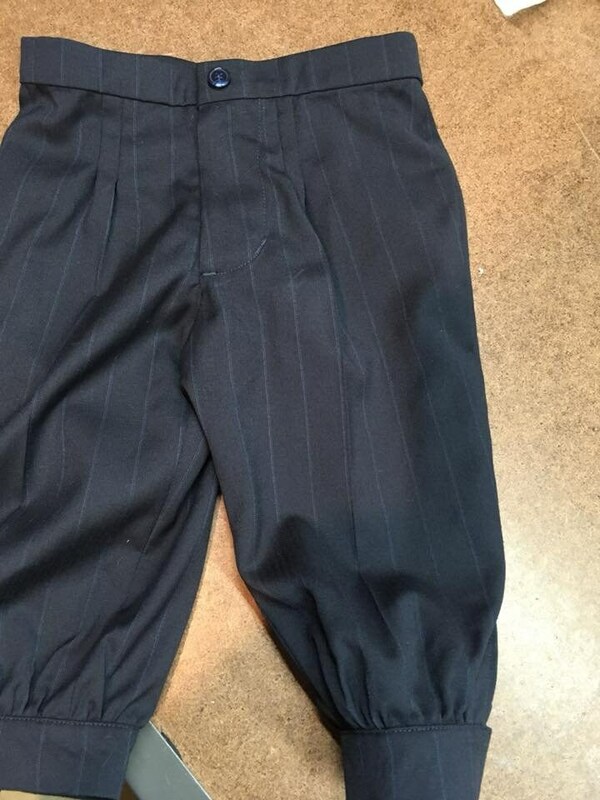 We have many menswear suiting fabrics to choose from! Knickerbocker pant is designed to be worn at the waist, and features a zip fly and clasp front with or without button detail. 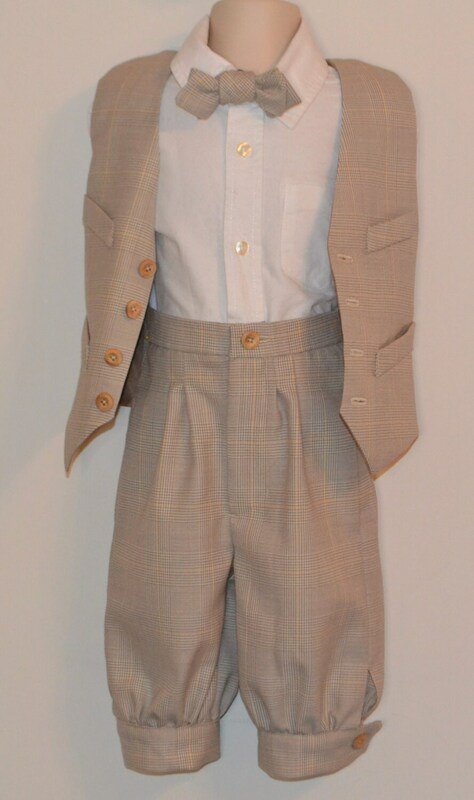 Waist is carefully tailored with double front pleats, and sturdy waistband. 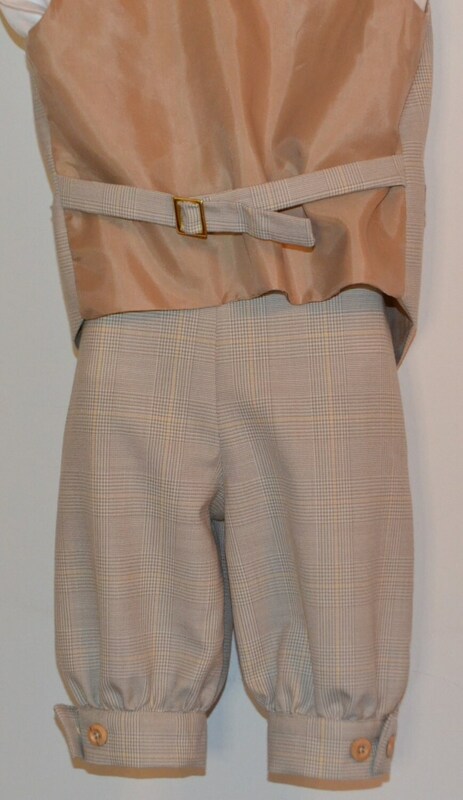 Pant features slit in-seam side pockets, with sufficient depth for his little hand some treasures besides! The gathered bottom and cuff of the knickerbocker pant is designed to button just below the knee, and has double button adjustment. 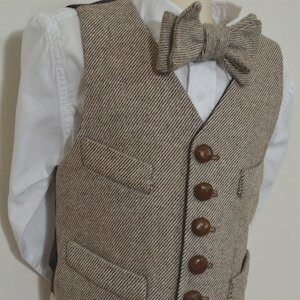 Vest is our popular 4 welt design, with wooden buttons (customizable). 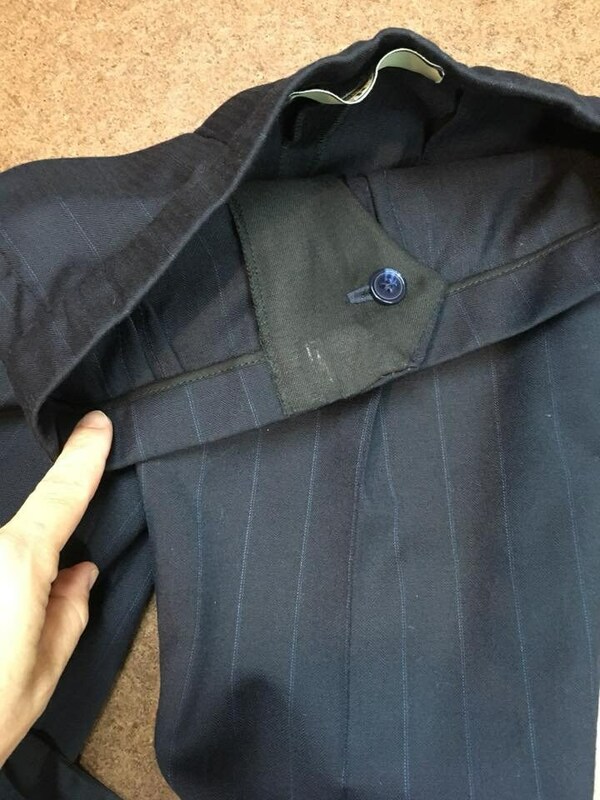 Welt pockets are functional. Back features a slider belt of wool, for perfect waist fitting that stays put. Our matching bow tie really distinguishes the outfit. 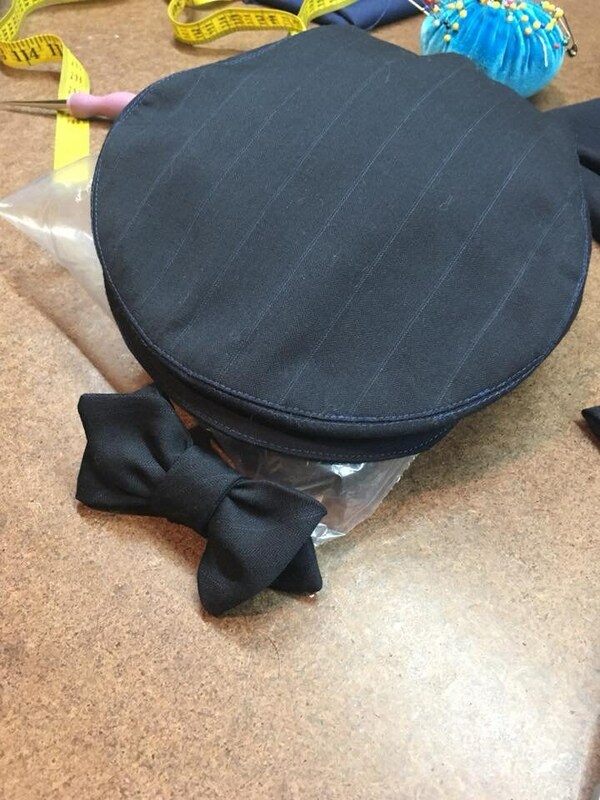 For this style, we chose a pointed end bow tie, which attaches to a front clip, and features a permanent, authentic bow tie knot with no dangerous strap around a child's neck. 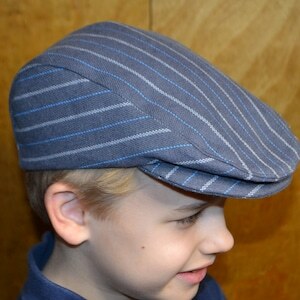 Our Gatsby-style flat cap is included in this order as well. It is a matching Early America style cap, fully lined, with petersham sweatband. 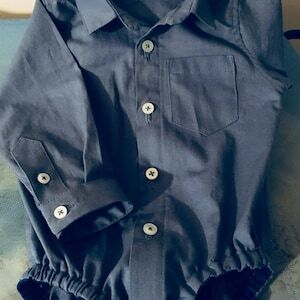 Made to order for the size suitable to your child. Sizing will be customized to your child. Measurements will be requested and products will be made to order based on customer provided measurements. 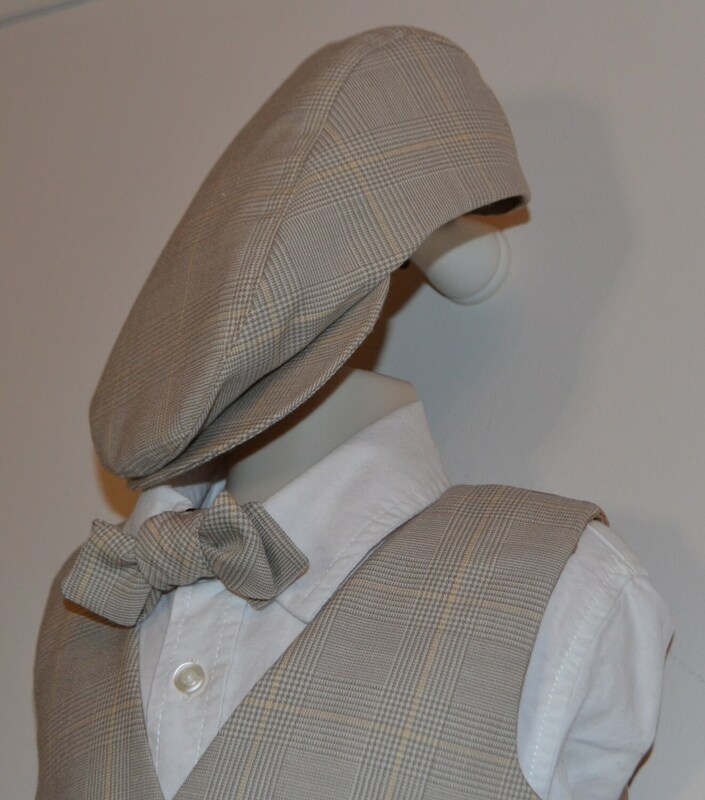 Knickerbocker, bow tie and vest patterns are original designs by AC Ashworth & Co. All Rights Reserved. All items featured here are lovingly handmade personally by Amy & Craig in our workroom, which is pet free and smoke free. Lead time applies, please inquire for current lead time based on shop workload.